In 2009, the first Little Free Library was constructed by a man named Todd Bol in Hudson, Wisconsin. What started as a spiritual gesture to honor his late mother, June, quickly became a neighborhood sensation. And less than a decade later it has evolved into a movement that has taken over the world with more than 75,000 adorable homes for books in over 80 countries. The concept is simple: Take a book, share a book. 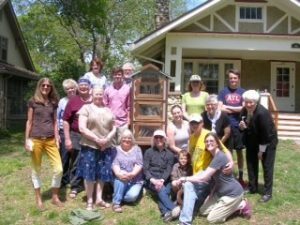 Community members are enabled and encouraged to borrow books from the Little Free Library and work together to keep it well stocked and operational. Most libraries contain titles for adults as well as children. Bol passed away on October 18th, 2018 of pancreatic cancer. He was only 62. The torch of the nonprofit organization, born of one man’s belief in small acts having a big impact, has been passed to capable hands. His legacy will inspire generations to come. To honor him, and to celebrate literacy among our citizens and the bonds of community, here’s a look at some of the Little Free Libraries in Lawrence and the people behind them. 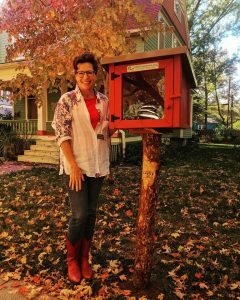 Cindy Koester has had her Little Free Library on Mississippi Street since 2014. It was built and given to her as a birthday present by her sister and brother-in-law. (Yes, a Little Free Library is a perfect, thoughtful gift for the bibliophile in your life!) The owl watching over the library was found at a sale by Cindy’s sister and really tops off this charming, hand painted library, as the owl is the unofficial symbol of Old West Lawrence. 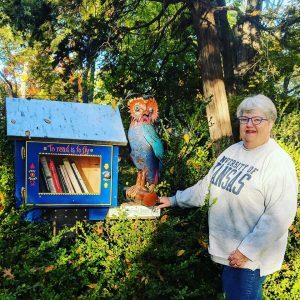 Cindy admits that the library is a great way for her to divest some of her collection, but like many keepers of Little Free Libraries, the main attraction has always been the idea of sharing books. “This has probably been one of the most fun things we’ve ever done,” she says. Jeff’s neighbor, Mike, came to the rescue and reconstructed the library from scratch, and it was re-established this past summer, to the delight of all. Leslie Milton is a teacher at Kennedy Elementary; naturally, literacy is very near and dear to her heart. 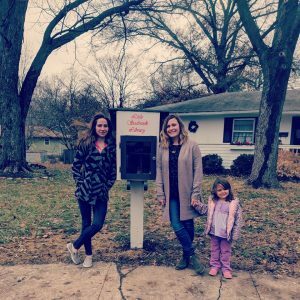 Her husband purchased her Little Free Library as a Christmas gift in 2017 from the Little Free Library website, an affordable option available to everyone and with many styles to choose from. Leslie loves the idea of encouraging reading in people of all ages, and her library is perfectly situated on Massachusetts to accommodate the most walkable street in town. 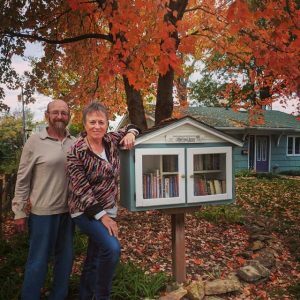 Gary Webber and Phyllis Farrar have had their Little Free Library in the Sunset Hills neighborhood since 2014. When Gary retired, he took on a number of projects, including construction of their library for an annual contest put on by Habitat for Humanity’s ReStore here in town. Gary’s ingenious repurposing of a kitchen cabinet from the ReStore earned him third place in the contest, but more importantly, it brought this beautiful library to their community. Phyllis says that the participation has been very high, with many takers and many leavers. “One of the most surprising things is how I’ve been exposed to books I might not have given the time to otherwise,” she says. The library in Breezedale is very special. It’s that first little library I remember so vividly and is dedicated to a wonderful woman I had the pleasure of knowing, Doris Stubeck. 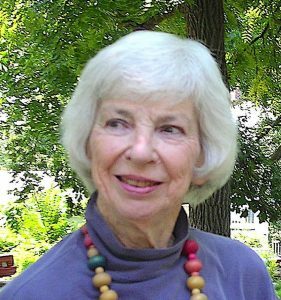 The library was Doris’ idea, and her neighbors banded together to make it happen. Its three tiers are nestled into the trunk of an old maple (turns out this a very popular repurposing of beloved trees). Many of the neighbors collaborated on the design, and it was then constructed by an architecture student at Lawrence High. Doris loved her neighbors, and they loved her right back. “She took care of everyone,” says Laurie Hart, whose house the library sits in front of. Doris was also an avid reader and adoring patron of Lawrence Public Library. For the community her life touched, there was no better way to honor her memory than establishing their library in her name. I know I echoed Todd Bol in saying that every Little Free Library is my favorite. But this is my favorite favorite. Many years after my first magical and lasting encounter with a Little Free Library, my husband, three children and I moved to a new neighborhood, one brimming with other young families. My new neighbors quickly became my friends, and by now, our Little Free Library tale should be a somewhat familiar one. Bob Reed constructed it from a recycled mailbox. His wife, Caitlin, and I painted it, had it chartered through the Little Free Library Foundation, and the whole neighborhood has had a hand in stocking it. And through our collaboration and shared desire to provide our people with access to books, my longtime dream of having a Little Free Library for myself, my children, and my community has come true. We could not be more proud to be a part of this amazing movement. If you are interested in starting your own Little Free Library, visit www.littlefreelibrary.org. Their website is full of helpful information, including libraries for purchase as well as blueprints for constructing your own. 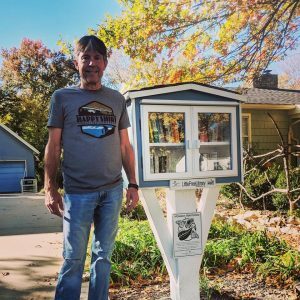 Also, if you are a Lawrence resident who has a Little Free Library and would like it to be featured in a future article, please email me at lnewton@lawrence.lib.ks.us. I would love to share your story. -Leah Newton is a Readers' Services Assistant at Lawrence Public Library.